Lake water quality can have many diverse meanings and interpretations. Most people define water quality in terms of clarity. It is a surprise to many northern visitors to find that most Florida lakes are far from clear. Large Florida lakes are generally part of the Florida fresh water drainage system. Fresh water runs north from Lake County exiting the St. Johns into the Atlantic Ocean at Jacksonville. South of Orlando, the Kissimmee Chain water finds its way south to Lake Okeechobee and the Everglades. Storm drain run off as well as human and agricultural discharges; add nutrients to the water causing the discolored appearance. During the warmer months or in times of wide water level fluctuations, algae blooms can appear adding to the cloudiness of the water. Algae are tiny plants that float on the surface of the water a few inches thick. When the sun is bright these plants bloom which can cause the surface water to turn a tan or light green color. The Harris Chain water underneath the algae is quite clear. Also, high winds or heavy rains can stir up bottom debris which can turn a clear lake dark. This does not mean that the water is polluted or dangerous for human contact and in most cases it does not affect the edibility of fish. For example, the Harris Chain is a very prolific fishery known for a population of giant large mouthed bass. Harris Chain water clarity can vary significantly. The clearest water is in the canals and protected bays. The main lake waters usually appear the cloudiest. This dark water high in nutrients is one of the main reasons we have such great fishing. The Harris Chain is not a popular place to swim or water ski. The low water clarity makes many people uneasy about swimming in these lakes. The clearest fresh water lakes in Florida are spring-fed white sand bottom lakes. These lakes are smaller than the Harris Chain lakes and are mostly private or have limited access. These lakes are not as fertile as the large lakes, but they make up for it with less boating and fishing pressure. Some of these lakes are close to residential areas and more than a few have large luxury homes built along the shoreline. 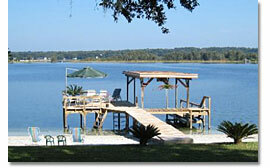 A good example of an in town clear spring-fed lake is Lake Gertrude in Mount Dora. If you have questions about Florida lake water quality, please contact us.